BEFORE: I’ve got a whole bunch of projects going on for school, but I always make time to go to an advanced screening. Today’s is Won’t Back Down which appears to be a dramatized and fictionalized version of the documentary Waiting for “Superman”. Because I have a 1000-word essay to write tonight, today’s review might be shorter than my typical advanced-screening tomes, but who knows, I might be very passionate about the film and find a lot to write about. Only time will tell. AFTER: Basically, the film boils down to this: if you’ve seen Waiting for “Superman” you don’t need to see Won’t Back Down. If you haven’t seen Waiting for “Superman”, watch it and skip Won’t Back Down. The reason being, it’s pretty much the same film except Waiting for “Superman” is real and provokes way more emotion in single scenes than Won’t Back Down does in the entire film. There are also many complaints about plot points, the biggest being logistics. 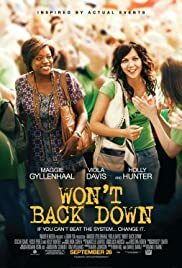 Jamie (Maggie Gyllenhaal) doesn’t have enough money to pay tuition for a private school for her daughter because she only makes $23,000 a year working two jobs. Perfectly understandable and believable. And then, she spends all this time and money to create the proposal for the new public school. If she doesn’t have enough money for her daughter’s education, how does she suddenly get enough money to put on a big extravagant party for hundreds of parents and their kids with cookies, decorations, and to top it all off, rulers for everyone in attendance. The math just doesn’t add up here. I’m not knocking the idea. In fact it’s a very important and controversial issue these days. But do yourself a favor and watch the documentary Waiting for “Superman” instead of watching this garbage.